Bob Ellicott’s vision of an athletic centre of excellence was realised the day the Australian Institute of Sport was officially opened – a grand endeavour conceptualised and brought to life. The achievement represented a milestone in Australian sport – and with it a change in attitude, approach and professionalism that became a hallmark of this country’s sports culture. On Thursday 13th October 2016, The Hon Robert Ellicott QC will be honoured for his long service to Australian sport when he is inducted as a general member of the Sport Australia Hall of Fame. As the Minister for Home Affairs, Ellicott was presented with the challenge to remedy Australia’s poor performance in the 1976 Montreal Olympic Games. “I started with a blank page in a sense ... I put my thinking cap on and worked out how I would do it in just a few short years,” Ellicott said, reflecting on the genesis of the Australian Institute of Sport. Ellicott had meetings with state sports ministers discussing the concept – justifiably they all wanted the centre in their state. “I told them it would be in Canberra, appropriate as the capital, and somewhere away from a big city where I could achieve the result I wanted,” Ellicott said. Ellicott announced the AIS in 1980 but many of the concepts were actually conceived on an official trip to China a year prior over a game of table tennis. Visiting a sports facility where young athletes were being educated, just outside Beijing, the athletes and staff were able to live and train within close proximity. As the minister for the ACT, Ellicott decided the AIS would be built alongside Bruce Stadium on land the Government already owned. The AIS opened in 1981and Australia’s results on the word stage immediately improved, but Ellicott’s vision for the Institute went beyond athletic performance. Ellicott contends this is something that often gets lost in modern sport – the importance placed on winning medals over celebrating the athlete’s dedication and consistency to compete at a world-level. He believes in celebrating champions but not at the expense of any other athlete’s efforts and that the ideas envisioned for the AIS from the beginning still exist today. Catering for young athletes and giving them the tools they need to succeed during and beyond sport. Ellicott, like many, gives enormous credit to Professor John Bloomfield for his strategy and development of sports and recreation reports in the lead up to the AIS. 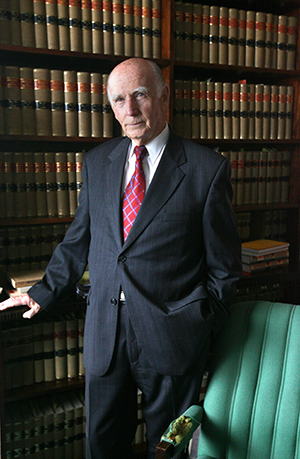 As the Institute opened, Ellicott retired from Parliament moving to the bench of the Federal Court as a Queens Counsel at the Sydney Bar. Ellicott played a prominent role in several significant sports cases including the ‘Super League’ war in rugby league. Born and raised in Moree in country NSW, Robert Ellicott wanted to be a barrister from the age of eight, a goal achieved when he attained First Class Honours in Law at Sydney University. Ellicott was inspired as a teenager by speeches broadcast on the radio by Winston Churchill and Australian Prime Minster John Curtin during the Second World War – motivating further ambition to enter public service. Throughout the latter of an illustrious career, Ellicott has been a long standing member of the IAAF Arbitration Panel. He has been a member of the Court of Arbitration for Sport including as a member of the CAS ad hoc Divisions for multiple Olympic Games and a Judge of the Oceania Division. Induction to the Sport Australia Hall of Fame represents a brilliant addition to an incredible career for Ellicott. “I do feel highly privileged. I felt like my contribution was, albeit quietly under the radar, to go about business and politics to achieve a result,” he said. For his commitment and excellence in sports administration, The Hon RJ (Bob) Ellicott QC will be inducted into the Sport Australia Hall of Fame on Australian sport’s night of nights – the sold out 32nd Sport Australia Hall of Fame Induction and Awards Gala Dinner, on Thursday 13th October at Palladium at Crown, Melbourne – presented by Etihad Airways. 2016 will mark the 32nd edition of this event, with eight Australian sporting icons, from on and off the field, to be inducted into the Sport Australia Hall of Fame. In addition to the eight inductees one current Member will be elevated to Legend status, becoming the official 38th Legend of Australian Sport.